Below you will find answers to the most commonly asked questions about Favia Dating Services. If you can not find the answers you're looking for, please contact us for further assistance. Are there Favia female members without profiles on the website? Do I have to go through hundreds of pages to find the few people I’m interested in? Do people actually meet through Favia Club? Do they ever get married? Do the ladies speak foreign languages? How can I send flowers or gifts to my lady? How can I visit a lady? How do you differ from other dating sites? How will I know how my money is being spent? Is it easy for a lady to leave her country and start a new life with a man abroad? What can Favia do for me? What type of people join Favia International Dating Club? Who will be able to view my personal details? Why are Ukrainian ladies looking for men from abroad? Why should I join Favia Dating Club? We have ladies visiting our office and joining our agency every day. It takes some time to interview them, get acquainted with their expectations and intentions, profile them, approve their applications, and prepare their profiles. Therefore, it is quite possible to have some female members, whom you will not be able to find on the website. We recommend that you search our database as often as possible. Not at all…. Most of our clients are busy people and therefore we have designed our services to suit their needs and lifestyle. In order to save them both time and money we offer them several different search options. Clients, who do not wish to browse through all the profiles, may avail of our search engine and advanced search engine via which they can search for ladies using a number of different criteria. Another option is the Romantic Compatibility Search tool, which is specially designed to help clients find that special someone by matching their requirements and expectations with those of ladies. If you prefer to search for ladies using our personalized service, you can avail of our Matchmaking Counsel. We will carefully screen all the ladies’ profiles and select only those who meet your requirements. We will then contact on your behalf those you have approved to find out if there is a mutual interest. Favia wouldn’t exist if we didn’t have our success stories. We are proud for having a great number of couples that have met with the help of Favia. Today they are happily married and bring up their children together. You may read their testimonials in the Testimonial section of our website. Most of the girls have some knowledge of English or other foreign language but the levels of their knowledge vary. Some are able to read and answer letters, others are studying foreign languages, but are not able to communicate freely and need the assistance of our translators. Our translation services are designed to keep the communication between clients smooth and to make sure nothing important is being lost in translation. You may certainly order flowers and gifts to be delivered to a girl/ girls of your choice anytime by simply visiting our online gift shop. It offers a variety of gifts to choose from at very reasonable prices. In case you cannot find exactly the present you are looking for, do not hesitate to contact us. Let us know what you have in mind and we will arrange it quickly, easily and at the best price available. We provide our clients with the best of comfort in travel, accommodation and transportation, including international travel medical insurance and emergency assistance to protect them during their trip. We provide around-the-clock assistance for client’s travel needs before, during and after their trip. For more information, please see Our Services/ Travel Services. In our Testimonials section you may get acquainted with the testimonials of clients, who have used our services, who have visited Ukraine and who have met our dedicated team. Upon request we can arrange for you a one-to-one conversation with some of our clients over Skype or phone. We offer the comfort, support, security and peace of mind that you need to make the most of your dating experience. We are more than just a dating agency… We are willing to go the extra mile to make sure you get the services you want and to get them exactly the way you wanted. To join Favia Dating Club you need to register and choose a membership program. Our membership programs are uniquely designed to suit the needs and level of commitment of different clients. They serve as a basis on which we build upon the individual experience of each client. After joining you can start searching our database of single ladies, to view their profiles and pictures, contact those that you wish to correspond with and use the wide range of services we offer. Our dating consultants are always available to answer your questions, advise you on any issue that might arise or assist you in any other way. We offer different membership programs, designed according to the needs and level of commitment of different clients. The membership prices, as well as the prices of individual services are available on our website. We also offer clients the opportunity to try some of our services for free. Once you become a Favia member you will have your own personal page, containing detailed information about your membership, your payment history, an account of all actions you have taken on the website and all services you have purchased, etc. We have designed these personal pages so that you are able to keep track of every cent you have spent and all the activities you have performed. We do not aim to just take clients’ money, but to offer them best value for their money, to help them enjoy their Favia experience and what is more important to help them bring their dating endeavours to fruition. It is not easy to leave your country, your family and friends, your culture and traditions. It is even harder to start a new life in a new and completely different country, adapt to the new environment and mentality and overcome cultural differences and trust and language barriers. Yet, girls who find their dream partners are willing to make this step in the name of love, no matter how hard it might be. Our website is 100% scam-free. We are your insurance against dating scammers, non-existing people trying to cheat behind beautiful photos. We are here to guarantee that our clients are real people, who are proud to go for what they believe will make them happy. We do our own background checks and verify all information provided by clients in order to ensure a scam-free service. Full profiles and photographs are available only to members of the club. All personal information is treated as strictly confidential and is observed only by persons with an authorized need-to-know. 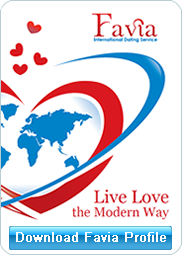 Favia International Dating is a service-oriented agency. We will provide you with an all encompassing suite of honest, high-quality introduction services and will assist you every step of your dating experience and search for a life partner. There is no guarantee for success in the field of introduction and dating, as love itself offers no guarantees. All the planning in the world may bring no results if the chemistry isn't right. However, we guarantee a dedicated, genuine service and we put our most devoted efforts to help clients find their perfect match. We believe that every new acquaintance has a potential to become relationship, and every new relationship is a whole new adventure and a treasure experience that one should appreciate and cherish. The most important thing is that we guarantee all our members are real people looking for love and long lasting relationships. Favia is an international introduction agency with many years experience in service and many success stories. The purpose of this website is to offer top-notch, scam-free online dating services. It aims to give clients the opportunity to search and browse through hundreds of singles profiles and to get acquainted with our agency’s vision, mission, services, overall operations, clients, team and testimonials of clients who have used our services. We are not a Club for desperate people. On, the contrary, our clients are modern people, whose everyday life is busy, work oriented or lacking opportunities for going to new places, meeting new people, and trying new things. They are independent, thinking people, brave enough to cross borders, change habits and shatter prejudices in their search for love and friendship. They are smart and self-confident people, who are not embarrassed but rather proud to use dating services as a way to live love and have social life the modern way. Your personal information is to be observed only by persons with an authorized need-to-know. Full profiles and pictures are available for browsing only to other members. Your contact details, as well as personally identifiable information not contained in your profile will not be revealed to others without your explicit consent. Women who are looking for foreign men are just like any other human beings looking for happiness and a better life. Each of our female members has her own reasons to look for a foreign man. Some of these women have been disappointed with Ukrainian men; others believe foreigners are better gentlemen, who will treat them with respect and passion and who will make great loving husbands and fathers. Ultimately, what Ukrainian women long for is to feel loved, desired and needed. If you are single, divorced, widowed or legally separated and you share our view that a lasting relationship is too precious to be left to chance, join us now. We will be happy to talk with you, discuss your desires, needs and fears and answer any questions that you might have. We will provide you with the security and discretion, which you cannot find in any Internet dating site, SMS chat, phone chat or newspaper personal ads. We offer an individual service that will make you feel special, understood and taken care of.